Having a sweet tooth, I’m always on the lookout for amazing desserts and sweets no matter where we travel. Sugar is, after all, a universal language, and everyone loves a little sweet ending, no matter where you go and what language you speak. I had read in a couple of guidebooks, and then again online of a particular ice cream shop in one of Paris’ ritziest neighborhoods that is said to have the best ice cream in the city. With that kind of reputation, you know I was going to work it into our schedule so that I could go and sample this amazing ice cream. Unfortunately, my plans were temporarily foiled as the first time my husband and I walked by the shop, we discovered that it was closed and had been for a little bit due to what seems to be the annual French tradition of taking “holiday” in August. Essentially, everyone goes out-of-town, or out of the country, on vacation for the month and stores just shut down! Luckily for us, the sign on the door indicated that the shop would be opening back up again in just a few days, so I moved a few items around on our itinerary and I re-worked our schedule so that we could come back again after the shop was open. 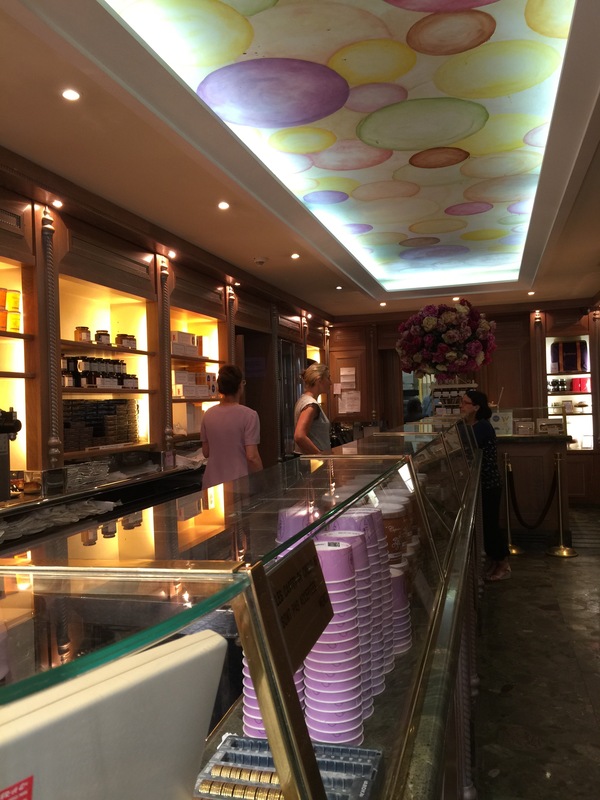 Located on the exclusive Ile Saint-Louis, Berthillon is the manufacturer of and retailer of what many call the best and finest French ice cream and sorbet. 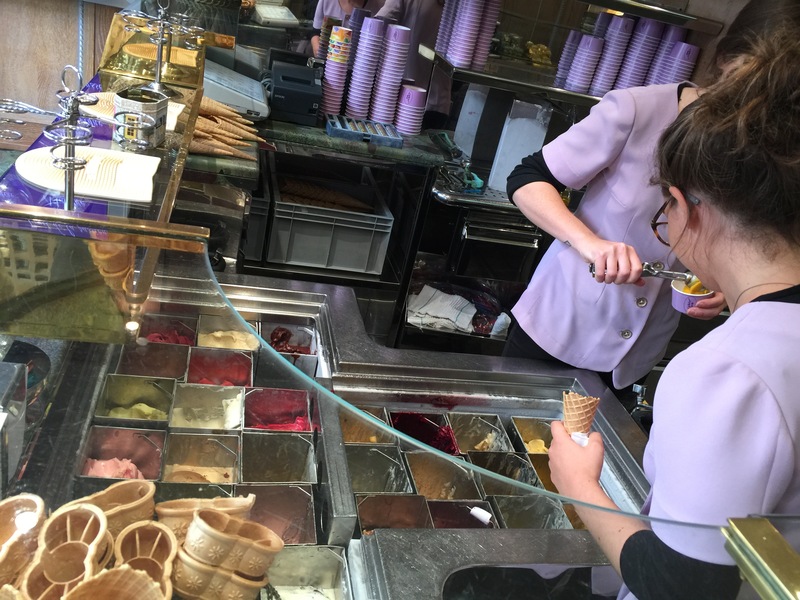 Having operated from its Ile Saint-Louis location since 1928 when Monsieur Raymond Berthillon opened a bistro at the location, the ice cream shop today is owned and operated by the Chauvin family, Berthillon’s direct descendants. The discovery of the wonders of Berthillon ice cream was made in 1961 when a French restaurant guide, Gault Millau, wrote about “this astonishing ice cream shop hidden in a bistro on the Ile Saint-Louis.” Since that time, Parisians and tourists have been flocking to the shop to get their hands on some artisan ice cream and sorbet. 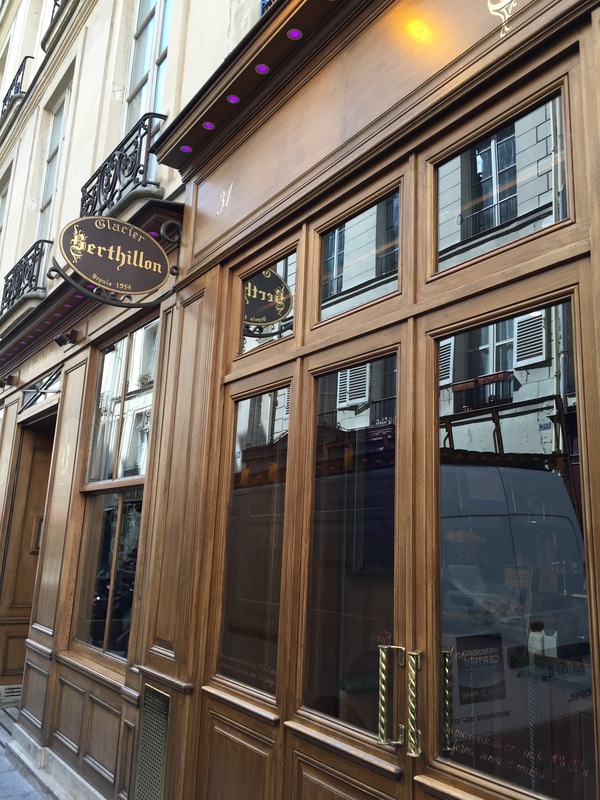 It’s not uncommon to find the line for Berthillon out the store and around the block. Old school, or old world, in its design with a wood and glass fronted shop and an almost high-end soda shop-type feel inside the store, this place seems like anything but a high end purveyor of France’s finest ice cream. In addition to the ice cream and sorbet the store did also seem to sell jams, cookies and chocolates. But truthfully, everyone was there for the ice cream. At the front of the store, there’s a display in French (with English translations) to all of the flavors of ice cream and sorbet being offered on that particular day at the store. Once you know what you want, you place your order with the girls behind the counter who scoop up your choice in either a cup or a cone. The ice cream is made by Berthillon in small batches which ensures the high quality and flavor of their artisan creations. We were lucky enough to get there early enough in the day that there were only a couple of people in line ahead of us when we arrived at the store. The following flavors were being offered when we arrived: rum & raisin, vanilla, chocolate, coconut, praline, pistachio, caramel nougat, hazelnut, amaretto praline, coffee, stracciatella, nuts & praline flavored chocolate, passion fruit, apricot, peach, melon, strawberry, mango, cherry plum, pear, raspberry, black currant, vine peach, rhubarb, grapefruit, and roasted pineapple & fresh basil. 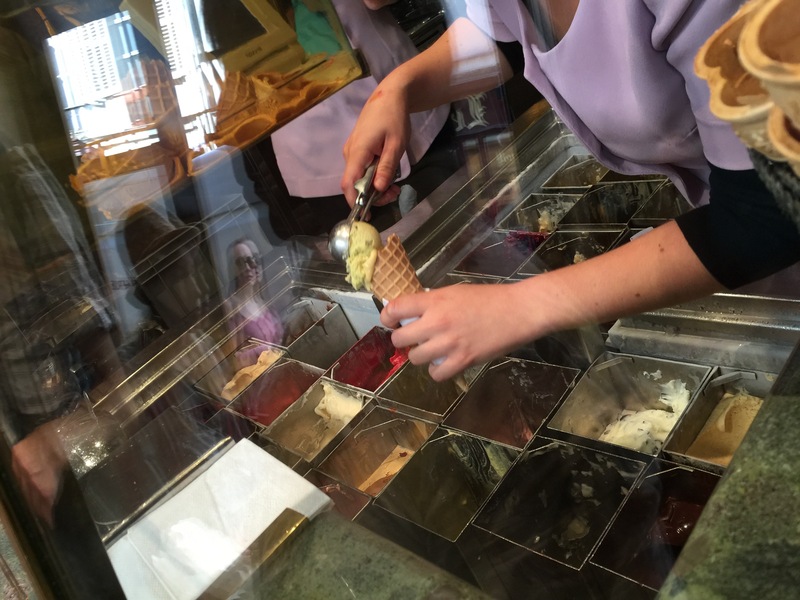 You certainly had your standard ice cream and sorbet flavors such as vanilla, chocolate, strawberry, pistachio and coffee, but there were definitely some surprises such as the roasted pineapple & fresh basil, the nuts & praline flavored chocolate and the caramel nougat. After debating back and forth, my husband and I both decided to get a two scoop cup of sorbet. My husband chose the black currant and passion fruit. The passion fruit I wasn’t surprised about because my husband loves passion fruit and any time he can get his hands on anything passion fruit flavored, he’ll do it. But the black currant was surprising. I wasn’t aware that my husband liked black currant, or maybe it’s just that we don’t see many things in the States flavored using black currant, but he said he wanted to try something a little different to see how it was. Besides, the black currant was this really rich dark maroon color which was just gorgeous. My husband said that the black currant was his favorite of the two flavors. He thought that the passion fruit was a little too light in flavor without enough tang to it and was just overpowered by the black currant. 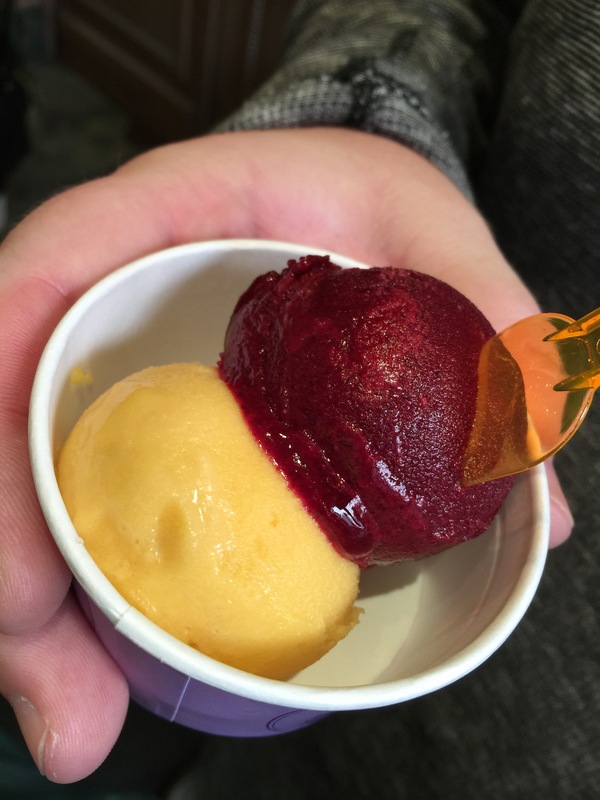 What my husband did enjoy was that both sorbet flavors were incredibly fresh and the quality of the sorbet really shines through. For my selection, I chose melon and mango. 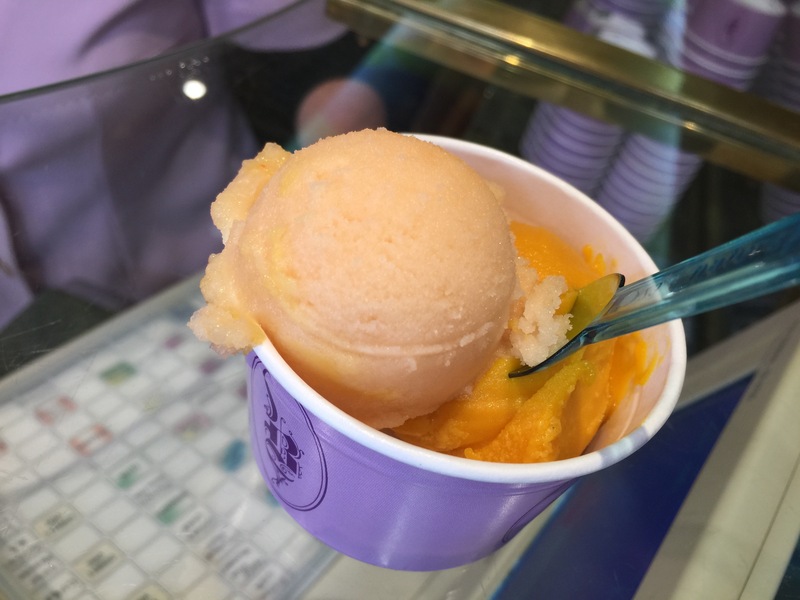 From the first bite, you can tell that essentially there is little to no sugar added to the sorbets, what you get is what the fresh, raw flavor of the fruit used to make the sorbet itself is. You’ve got to appreciate an ice cream maker who can make ice cream this fresh and high quality. For me, the mango was my favorite flavor. It literally tasted like it was pure mango puree. It was sweet, delicious and refreshing. The melon was also refreshing, but the flavor of the mango trumped the melon completely as the melon flavor was much more muted. I could have had a whole pint of the mango. 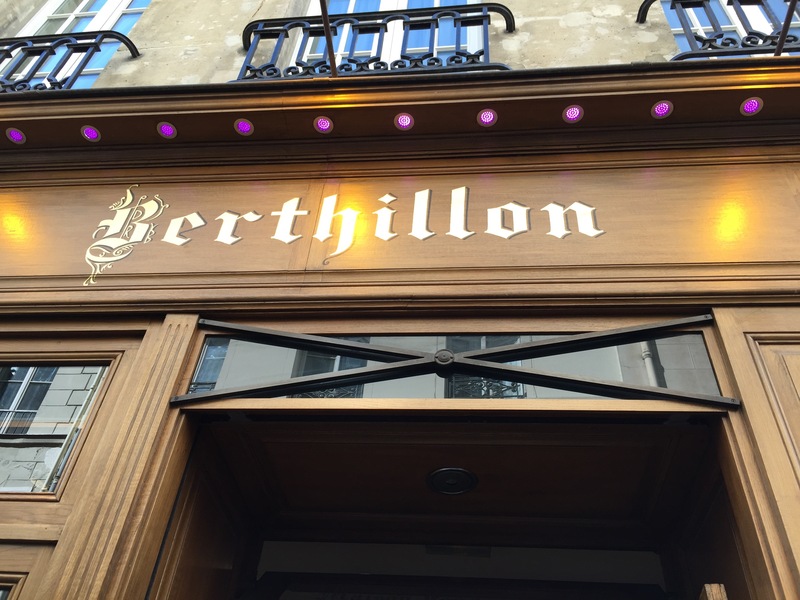 Berthillon prides itself on its reputation of being the best ice cream in Paris, and there are numerous cafes and restaurants around town that advertise the fact that they sell Berthillon ice cream. My husband and I both thought that their ice creams and sorbets were delicious and probably worthy of their reputation. However, their reputation also comes with a price tag, whereby Berthillon’s ice cream is more expensive than your average ice cream, and their scoops are probably 1/2 to 1/3 the size of a normal ice cream scoop, so you’re paying a lot more and getting a lot less in the form of tiny little scoops. As a tourist, it doesn’t bother me because you know if you want to try something that is supposedly that good, it’s going to cost you and perhaps you shouldn’t be so concerned with your budget when you’re traveling. But at these prices, Berthillon probably wouldn’t be my first choice for ice cream on a regular basis.